BEIRUT (AP) — As fighting rages just across the border, Lebanese are giving signs of joining the battle on rival sides of Syria's civil war — Sunnis on the side of the rebels, Shiites on the side of the regime — raising fears that Lebanon with its volatile sectarian divisions will be dragged into the conflict. 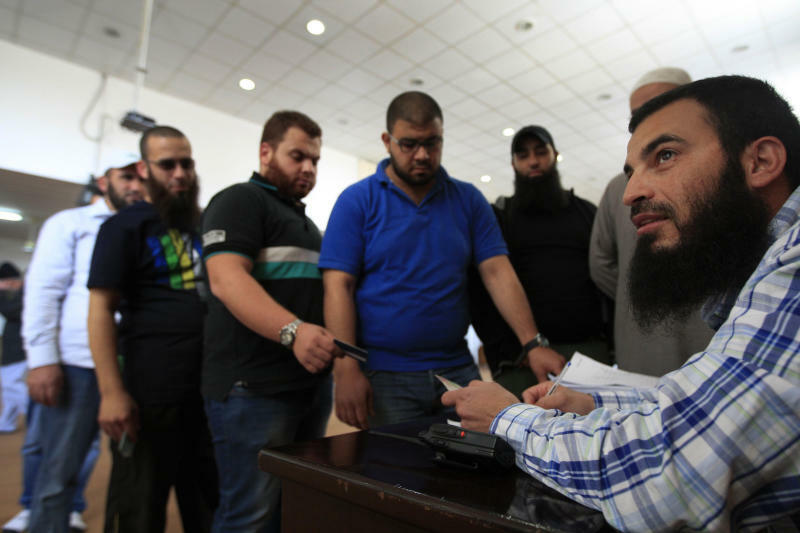 On Tuesday, around two dozen men lined up in the office of one of the clerics in the southern coastal city of Sidon, signing up to join the jihad. In recent days, tensions have been fueled by heavy fighting inside Syria close to the border with Lebanon, where regime forces have made strong gains in a campaign to secure a corridor from the capital Damascus to the Mediterranean coast. The Syrian military has been helped in the fight by Shiite Lebanese fighters who are supported by Hezbollah. The powerful Lebanese militant group says it is not sending fighters but supports the so-called "popular committees" that have joined the fighting to defend their fellow Shiites in Syria. Rockets from Syria have hit mostly Shiite areas in Lebanon on daily basis, apparently from Syrian rebels in retaliation for Lebanese Shiite help to the regime forces. Rockets killed at least two people this week and are reaching deeper into Lebanese territory. There are also fears that Islamic militants among the Syrian rebels could carry out direct attacks in Lebanon in revenge for Hezbollah's support of the regime of Syrian President Bashar Assad. "Lebanon is on the edge of the cliff," warned lawmaker Sami Gemayel. "We are dragging the conflict from Syria into our country. It's like the border between the two countries no longer exist," he told reporters Tuesday. Lebanon is sharply split between supporters and opponents of Assad, a legacy of decades of Syrian political and military dominance over its smaller neighbor. The split largely falls along sectarian lines, with Sunnis opposing Assad and Shiites backing him. That mirrors the divisions within Syria itself, where mainly Sunni rebels are battling Assad's regime, dominated by the Alawite sect, an offshoot of Shiism. Since it began in March 2011, Syria's conflict has fueled local tensions between the communities in Lebanon, with bouts of street fighting and kidnappings. In the northern Lebanese city of Tripoli on Monday, a group of Sunnis captured an Alawite man, stripped him to the waist, tied a rope around his neck as they paraded him through the streets. "I am an Alawite shabiha," was written on his bare chest, referring to Syria's feared pro-Assad militiamen. In recent days, unknown assailants set fire to Alawite-owned shops and also hurled stones at a bus carrying Alawites in Tripoli, a predominantly Sunni city with a small Alawite community. The intense fighting near the border has raised the temperature considerably. The Qusair region where the fighting is taking place is strategic because it links the Syrian capital Damascus with the Mediterranean coastal enclave that is the heartland of Assad's Alawite sect. Syrian rebels accuse Hezbollah of fighting alongside Assad's troops and attacking rebels from inside Lebanese territory. Hezbollah denies taking part in the civil war. But top Hezbollah official Nabil Kaouk said Monday that his group is "performing a national duty" toward Lebanese Shiites living in Syrian border towns and villages by supporting the "popular committees." The head of the main Western-backed Syrian opposition group, the Syrian National Coalition, said Hezbollah's role in fighting amounted to "a declaration of war against the Syrian people." "Shiite Lebanese should prevent their sons from killing Syrians. They should not fall victim to this conflict," he said Tuesday. Syrian rebels have repeatedly called on Lebanese officials to control their side of the border. But Lebanon has been without a government since former Prime Minister Mikati stepped down last month over a political deadlock between Lebanon's two main political camps and infighting in his government. Authorities are reluctant to send the army in large numbers to the border area, partly because of fears the military would get caught up in the violence and break up along sectarian lines, as it did during Lebanon's 1975-90 civil war. On Monday, two leading Lebanese clerics issued religious edicts urging Sunni Lebanese to defend their brethren in Syria, saying Hezbollah had violated the Lebanese neutrality by taking part in fighting. "We were opposed to any side getting involved in the Syrian revolution. But Hezbollah's insistence to support the despot Bashar Assad has left us with no choice," Sheik Ahmad al-Assir, one of Hezbollah's harshest critics, told The Associated Press on Tuesday. Another Sunni cleric, Sheikh Salem al-Rafie issued an edict calling for a "general mobilization among Sunnis to protect Sunni brothers." 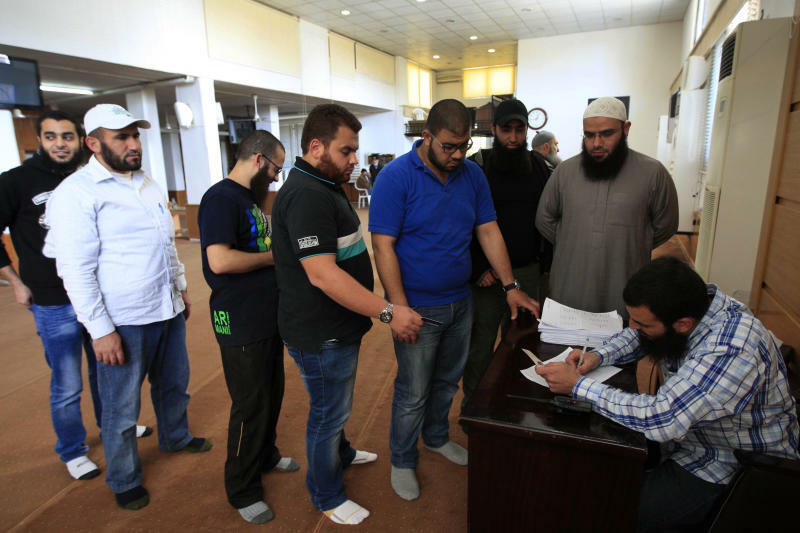 So far, the Sunnis lining up to join the fight in the Sidon office appeared to be few, in what may have been a symbolic gesture. But many worry about escalating sectarian hatreds brewing across the country and the potential of being dragged into the war. "It is not a question of if, only when and for how long," said Amin Rafie, a 43-year-old school teacher in Sidon on Tuesday. Syria's conflict is grinding into its third year, with rebels controlling much of the north and east while the regime keeps a tight grip on Damascus, the Mediterranean coast and the major cities in the west, except the commercial hub of Aleppo, scene of a monthslong, destructive battle for control. The fighting has exacted a huge toll on the country, killing more than 70,000 people, laying waste to cities, towns and villages and forcing more than a million people to flee their homes and seek refuge abroad. In Syria, two bishops who were kidnapped while traveling outside Aleppo were released Tuesday, less than 24 hours after gunmen pulled them from their car and shot their driver dead. 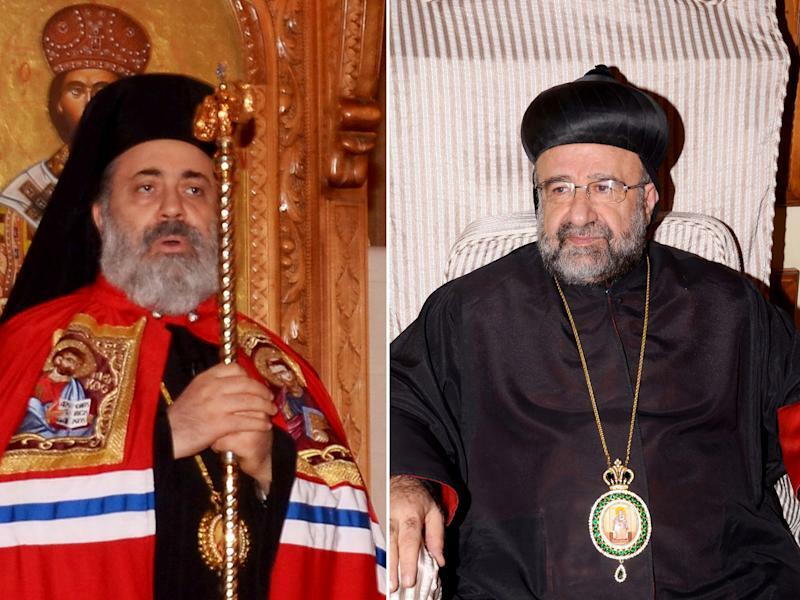 The two kidnapped priests, Bishop Boulos Yazigi of the Greek Orthodox Church and Bishop John Ibrahim of the Assyrian Orthodox Church, were released Tuesday and arrived safely at their respective patriarchates in Aleppo, according to Greek Orthodox Bishop Tony Yazigi. It was not immediately clear who kidnapped the men. In Israel, a senior military intelligence official said that Assad used chemical weapons last month against rebels. It was the first time that Israel has accused the embattled Syrian leader of using his stockpile of nonconventional weapons. "To the best of our professional understanding, the regime used lethal chemical weapons against the militants in a series of incidents over the past months," Brig. Gen. Itai Brun of Israeli military intelligence told a security conference in Tel Aviv. "Shrunken pupils, foaming at the mouth and other signs indicate, in our view, that lethal chemical weapons were used." U.S. Secretary of State John Kerry, speaking in Brussels, urged NATO to prepare for the possible use of chemical weapons by Syria and called for alliance members to boost their assistance to the Syrian opposition. NATO member Turkey borders Syria and would be most at risk from such an attack. NATO has deployed Patriot missile batteries in Turkey. AP writer Bassem Mroue contributed to this report.